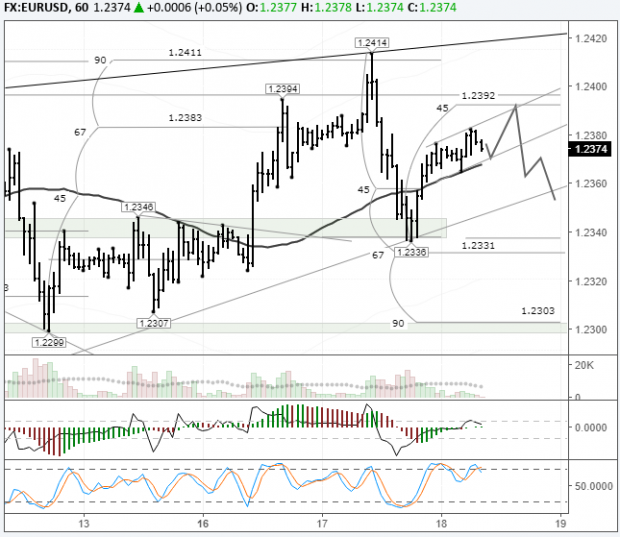 On Tuesday the 18th of April, trading on the EURUSD pair closed slightly down. By the time trading closed, the euro had lost 10 pips against the dollar. In the US session, the euro shed 78 pips to reach 1.2336 after having hit a new high at the beginning of the European session. The drop intensified after the release of disappointing German data from the ZEW. The euro then recovered from 1.2336 to 1.2376 on the back of a broadly weakened dollar and declining US10Y bond yields. I reckon this was down to renewed fears over US-Chinese trade relations. 11:30 UK: CPI (Mar), retail price index (Mar), PPI – input (Mar), PPI – output (Mar). 17:00 Canada: BoC interest rate decision, statement, and monetary policy report. 17:30 USA: EIA crude oil stocks change (13 Apr). On Tuesday, the euro slid from the 90th degree to the 1.2336 mark. In the US session, the bears tried to break the trend line, but the decline on US10Y bond yields forced sellers to retreat to 1.2376. In Asia, trading on the dollar is mixed. The single currency is currently in positive territory against it. Since the euro crosses are enjoying increased demand, the EURUSD pair will hit a new high before recommencing its downwards trajectory starting from the 45th degree. I’m expecting today’s movements to largely mirror yesterday’s, except with less intense fluctuations. 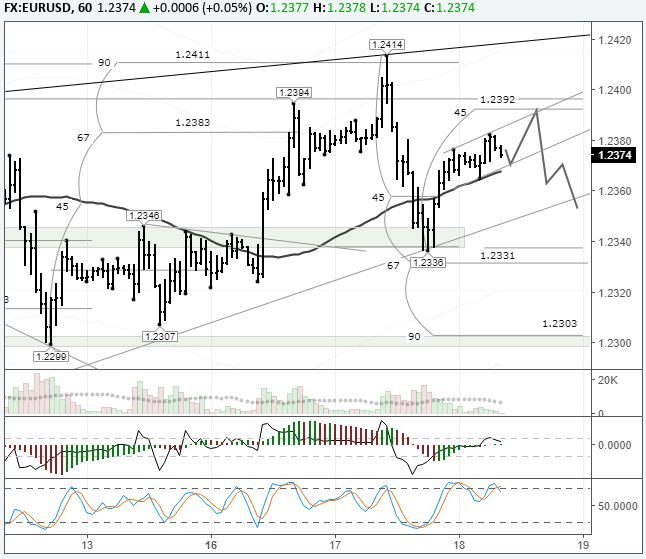 The hourly cycles tell me that the EURUSD pair will continue declining until 12:00 EET on the 20th of April. In order to compel buyers to close their long positions, sellers need to break two levels; 1.2357 and 1.2330. Inflation data from the UK and Eurozone will be the centre of focus today, in addition to the Bank of Canada’s monetary policy meeting.